This popular spiced Somali rice dish is known as bariis iskukaris. In construction, it is very similar to East African pilau rice, however, instead of using vegetable broth or water to cook the rice, this dish generally uses meat broth to add more flavor. The following recipe is an adaptation of the vegetarian bariis found at the Somali Kitchen. It has been reproduced and adapted with permission. 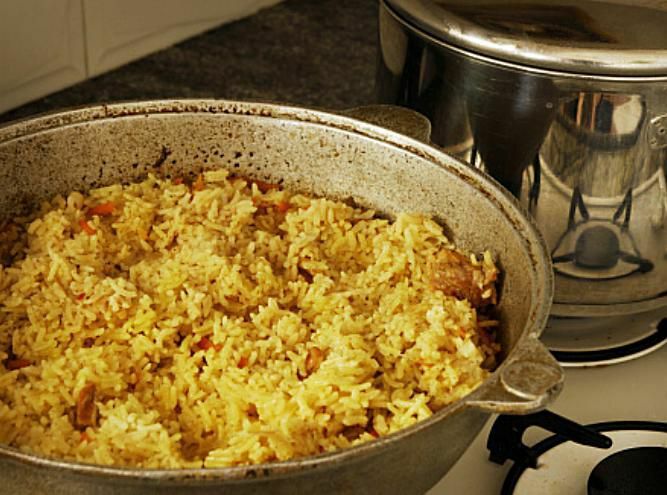 While many recipes incorporate a meat stock for cooking the rice, this one has used tomatoes (which is a typical ingredient for this dish in Somali cooking). Wash the rice and soak it in water until ready for use. Fry the lamb for a few minutes until browned. Remove from the pot until later. Fry the onions until it caramelizes in the pot, about 2 minutes. Grind the dry spices and add with the garlic. Cook for a minute allowing the heat of the oil to release the aroma of the spices. Add the diced tomatoes and cook until it breaks down into a sauce. Add the lamb back into the pot. Drain the rice and add the measured out water. Bring the rice up to a simmer then cover the pan with aluminum foil. Ensure the pan is well sealed. Simmer for about 15 minutes or until all the liquid has been absorbed.